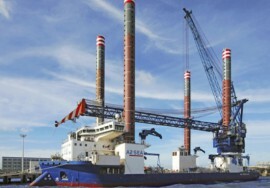 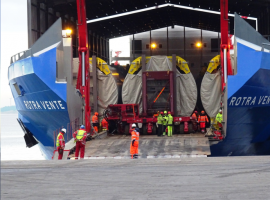 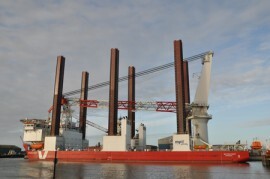 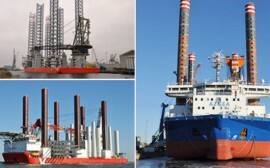 Swire Blue Ocean’s jack-up Pacific Orca has arrived in the Port of Esbjerg to load the last four MHI Vestas turbines for Vattenfall’s European Offshore Wind Deployment Centre (EOWDC) in the Aberdeen Bay. 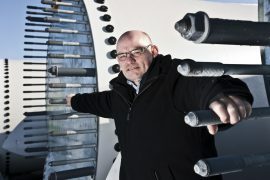 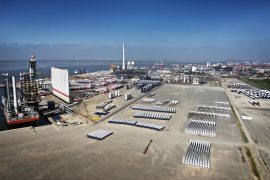 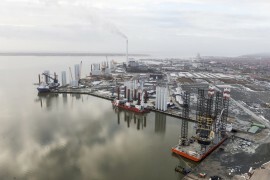 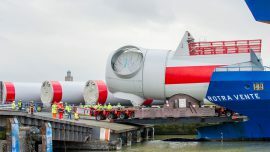 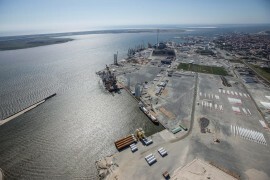 A capacity of 1,300MW of offshore wind in wind turbine components was shipped via Port of Esbjerg in 2017 – 200MW more than in the previous year – according to the port’s annual results, which show a 2.2% increase in turnover at EUR 31.61 million and a net profit of EUR 10.83 million. 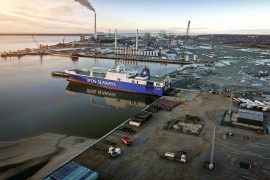 Blue Water Shipping (BWS) has put into operation a new 116,000m² multiterminal in the East Port area of the Port of Esbjerg in Denmark, boosting its capabilities to accommodate RoRo vessel traffic, which has increased at the port with the wind turbine industry’s use of RoRo vessels and more operations by the existing RoRo customers. 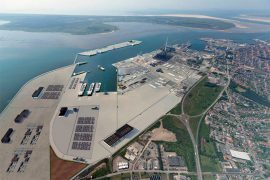 Following the completion of the works on the expansion at the Port of Esbjerg, the port took over the new harbour area in mid-October. 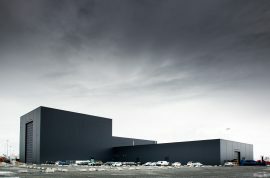 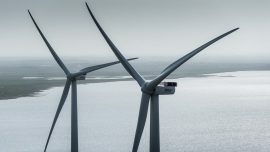 MHI Vestas today (5 October) informed that it officially opened the Power Converter Modules (PCM) factory at the Port of Esbjerg, adding that the assembly of PCMs for its V164 offshore wind turbine has begun. 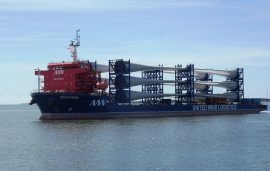 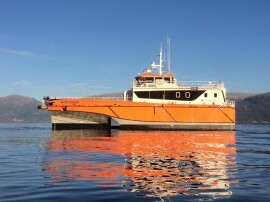 United Wind Logistics’ new special purpose vessel Vestvind arrived at the Port of Esbjerg today, 7 July, the port reported via social media. 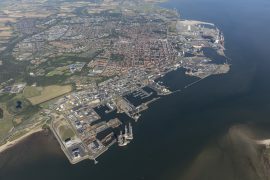 The Port of Esbjerg, a Danish offshore wind hub, expects increased activity towards 2030, both within existing and new business areas and is looking into the possibilities of further expansion to meet the demand. 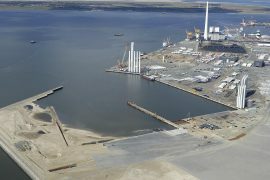 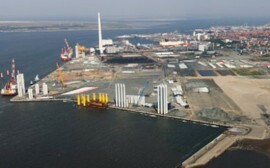 The Port of Esbjerg informed via social media that it is preparing to handle the components of the Horns Rev 3 offshore wind farm in Denmark. 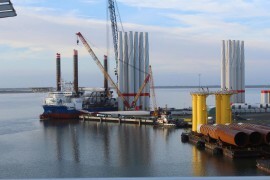 Offshore wind farm components accounting for 1,100MW of capacity were shipped from the Port of Esbjerg in 2016, more than double the amount in 2015, according to the port, which reported a record turnover of EUR 30.94 million and a record net profit of EUR 10.68 million for 2016. 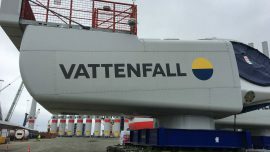 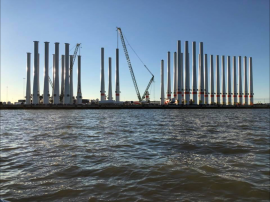 Components for the first Siemens 7MW wind turbine to be installed at Nissum Bredning are expected to sail out of the Port of Esbjerg late tonight, 13 November, onboard the Osprey Valiant barge.